There are only two ways to get between New Zealand's main islands and they are to either fly, or take one of the Cook Strait ferries. 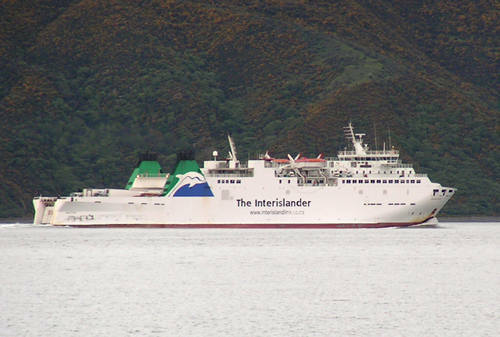 On our recent visit down to the Marlborough region at the top of the South Island we made the southbound trip on the Kaitaki - the biggest vessel in the ferry fleet and one that can take 1600 passengers - then returned on the Arahura (1000 passengers). The third vessel is the smaller Aratere (350 passengers). Both journeys were excellent, which was a relief because sometimes the weather can make the passage quite rough. However it has to be said the three-hour or so cruise is superb on a nice day. You get an excellent view of Wellington and its lovely harbour and then the treat of wending your way down through the beautiful Marlborough Sounds to the picturesque port of Picton. The Sounds are gorgeous and there are times it seems you need to fight your way through the picture takers to get your own photos! Getting on and off the ferries is a breeze as they have the operation down to a fine art. You get to Wellington port's Aotea Quay about an hour before departure time, line up in queues - seemingly on size of your vehicle and its required turning space - and then you wait to be ushered on board. The ferries leave Wellington at 8.25am, 10.35am (from 1 November to 31 March), 1.50pm and 6.15pm. There are plenty of crew around to make sure you get things right and there are announcements about putting your vehicle in gear and putting the handbrake on. Both of which you must remember as to be called down to the car deck over the loudspeaker system would be embarrassing. Then it's off up a flight of stairs and into the very comfortable interior of the ships. There are restaurants and eateries galore, places to watch TV, to play video games - even a picture theatre with the latest movie playing. 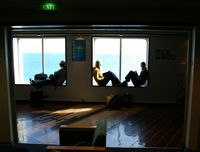 The ferries have plenty of comfortable seats and tables at which to play cards, or do crosswords. And it has to be said that in spite of all on offer it is a good idea to take along reading material and games for the kids. I kicked myself that I didn't take my laptop with me. Getting off the vessels is again really easy and takes place within minutes. It really couldn't be a simpler system. Taking the Interislander ferries is a terrific adventure for kids and adults easier and it is a fantastic way to see the Marlborough Sounds.